SKU: seca769baseline. Categories: Medical, Seca. Tag: seca. Versatile, low-maintenance and site-independent with economic battery operation – the seca 769 is ideal for daily use in hospitals and doctorsʼ practices. With its transport castors, the column scale is also easy to move around. The seca 769 is equipped with several intelligent functions. 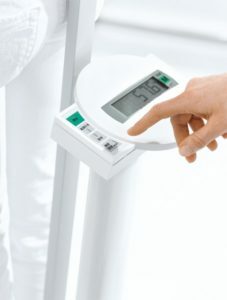 For example, the BMI function permits a reliable evaluation of the nutritional condition of the patient. The column scale will be delivered with the measuring rod seca 220 so that both weight and height can be determined in just one time-saving step.